Last night the Minnesota Wild headed to Detroit for the second night of their back-to-back road trip. It would be the second road trip that Minnesota was without their captain Mikko Koivu; and to make matters worse for the Wild their starting goaltending Niklas Backstrom suffered a pulled groin against the Montreal Canadiens Thursday night. It took 35 seconds into the game for Detroit to strike. Getting an early goal against the Wild has not always been a sign of a win for the Red Wings against the Wild as in the previous game in Detroit this season. The Red Wings held on to a 1-0 lead until the final minute of the game with Mikko Koivu had an exploding shoulder on Niklas Kronwall and tied the game. 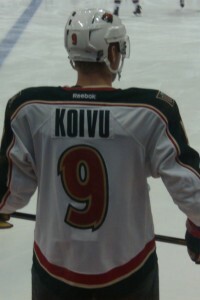 Koivu then assisted on the overtime winner; there is a reason he makes the big bucks in Minnesota and why the team is struggling without him. While the Wild were missing captain Koiuv and Backstrom the Red Wings were also without their captain. Nicklas Lidstrom missed another game last night with what is being called a deep bone bruise (he is expected to miss tomorrows game vs. the Chicago Blackhawks as well). Detroit has been missing Pavel Datsyuk since their home winning streak was snapped by the Vancouver Canucks; but you would not have guessed with the 6-0 out come of the game. Mixing up the lines Head Coach Mike Babcock moved Johan Franzen to the third line with Darren Helm and Drew Miller; Justin Abdelkader centered Todd Bertuzzi and Dan Cleary on the second line while Henrik Zetterberg took the top line with Valtteri Filppula and Jiri Hudler. Offense coming from all lines and from the defense as rookie Brendan Smith scored his first NHL goal it was not a good night for Josh Harding. It would take six goals over two and a half periods but eventually Harding would get pulled for Matt Hackett. Just a Red Wing team on a mission.